By meteorologists, Lisa Murray, Nick Zachar and Rob Kerr. This week we were visited by a low from the Tasman Sea closely followed by Cyclone Cook from the Tropics. One of the significant impacts this week was flooding due to excessive rainfall amounts. Rainfall amounts topped out at 350mm over the past 60 hours in parts of northwest Nelson, with 200mm+ measurements recorded about Coromandel Peninsula, and between 150-200mm in the Kaimai Ranges. Rainfall amounts of between 30-50mm were commonplace elsewhere. Surface flooding was widespread in many regions as the low from the Tasman Sea combined with a tropical air feeding down from Cyclone Cook. These rainfall accumulations exacerbated issues in regions with already saturated, sodden ground. 100km/h Whakatane, before the weather station lost power just prior to Cyclone Cook making landfall. A significant number of trees were uprooted contributing to the widespread power outages and property damage. Rain: between 150-200mm rain in 12 hours across Raukumara Range. Surface flooding, and swollen rivers, along with slips which closed roads across parts of the Coromandel Peninsula, Bay of Plenty, Gisborne and Hawkes Bay. Wave Buoy in the Bay of Plenty recording wave heights reaching 12.5 metres at 6pm yesterday, just prior to landfall. Waves: Waves to 12.5 metres were recorded by the regional councils wave buoy. Thankfully these waves occurred about 3 hours before high tide, as there would likely have been more damaging coastal inundation if Cyclone Cook passed three hours later. First track (Figure 1) issued on Tuesday when Cyclone Cook moved into MetService area of responsibility versus actual recorded track plus forecast track for Friday afternoon and evening. (Figure 2). Although they may look very similar, if you look closely you can see that the actual track was slightly to the east of the forecast tract, and Cyclone Cook did not strengthen as quickly or as much as global weather models predicted. Cyclone Cook made landfall with a central pressure of 980hPa being recorded at Whakatane. Tropical cyclones can be notoriously difficult to forecast, both in intensity and exact track. In the case of Cyclone Cook, the overall track shifted slightly eastward in the hours before making landfall in the Bay of Plenty. In the 12 hours before landfall, Cook went through a re-intensification phase due to upper dynamics (jet). If the central pressure was as models had predicted at this time, Cook would have veered further westwards before landfall. However, central pressure was significantly higher than forecast when it made landfall (~10hPa) and so got turned less. We are unable to measure that aspect of a such a system whilst it is over the ocean. Being such a compact system, Cyclone Cook had a limited swath of intense, damaging winds. And as the cyclone did not intensify as deeply as the global and small-scale weather models predicted, the strongest winds remained east of Auckland, and instead significantly impacted the Bay of Plenty. Had the track not shifted, or if it had tracked slightly further west, Auckland would have seen winds comparable to what were measured at White Island, Whakatane or Cape Turnagain. While Auckland experienced a lucky escape from the cyclone, others in the Bay of Plenty, Gisborne and Hawkes Bay bore the brunt of the storm. Advanced warning of this event and its possible impacts enabled individuals to take the necessary precautions and prepare for the worst-case scenario. The safety of property, animals and loved ones is, and will continue to be, MetService’s first priority. As Cyclone Cook moved southwards, it directed a southeasterly flow across the lower North Island. As Wellington is quite sheltered from this direction, the overall wind speeds remained relatively light (at 85km/h). However, northerlies pushed into the area Friday morning as Cook moved further south, and are now gusting 85km/h from that direction. And it’s important to keep in mind that Wellingtonians are well-versed when it comes to strong winds. Hand drawn isobar chart by one of Expert Meteorlogist John Crouch. Christchurch experienced the tail end of Cyclone Cook. 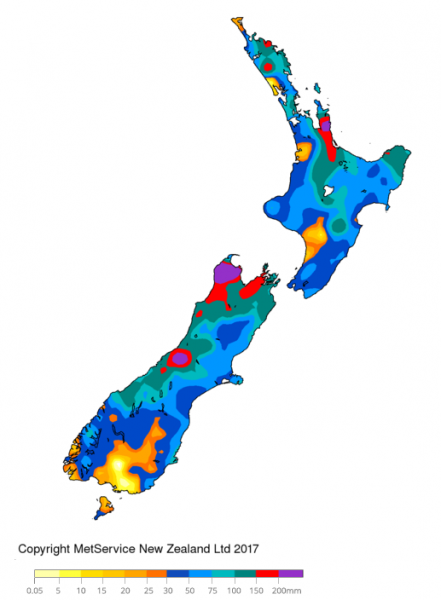 Rainfall amounts of 30-50mm were commonplace across Marlborough and Canterbury, with higher amounts across Banks Peninsula. There are reports of the Heathcote River spilling its banks, along with surface flooding in other places. Visible satellite and radar image of Cyclone Cook. 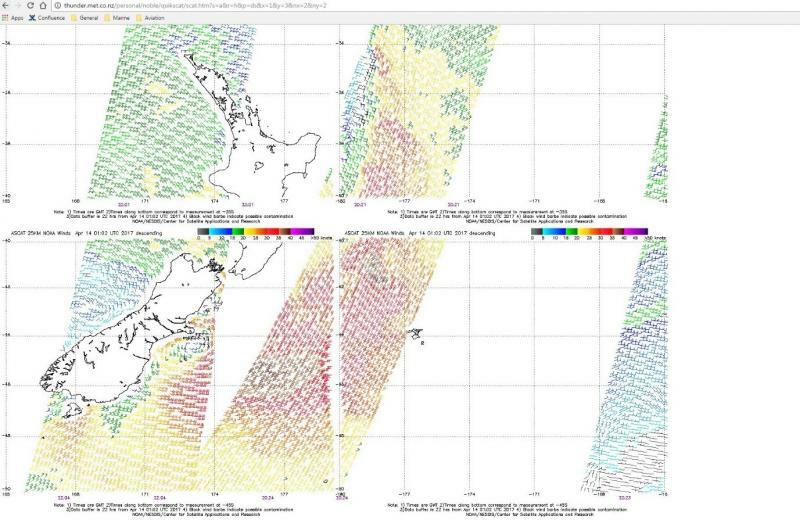 Scatterometer winds from polar orbiting satellite over New Zealand showing wind barbs over coastal waters.